UNIVERSITY PARK — Penn State fans probably can expect to see a lot of Sean Clifford in today’s Blue-White Game as the quarterback tries to strengthen his hold on the third-string job behind Trace McSorley and Tommy Stevens. The spring scrimmage will pit the first-teamers (Blue) against the second-teamers (White) as usual during coach James Franklin’s tenure. McSorley is on the Blue team, and so is Clifford, which could mean that McSorley might not see much time playing today. Stevens is out with a foot injury, so Clifford needs to get as many reps as possible. Jake Zembiec, the likely fourth-string quarterback, is on the White team, which would suggest he’ll see the bulk of snaps with that group. So, put all of that together, and it could be a short day for McSorley as Clifford gets reps with the first-team offense. Then again, it’s only a scrimmage, so the coaches could have anything planned, such as rotating the backups between the two teams. Offensive coordinator Ricky Rahne gave a scouting report on Clifford earlier this week. “Been happy with what he’s been doing,” Rahne told gopsusports.com. “He’s been a guy that’s been able to get more reps this spring and really has been able to do some good things. So, happy with what Sean’s doing, really from the mental side and being able to consistently put together good plays. 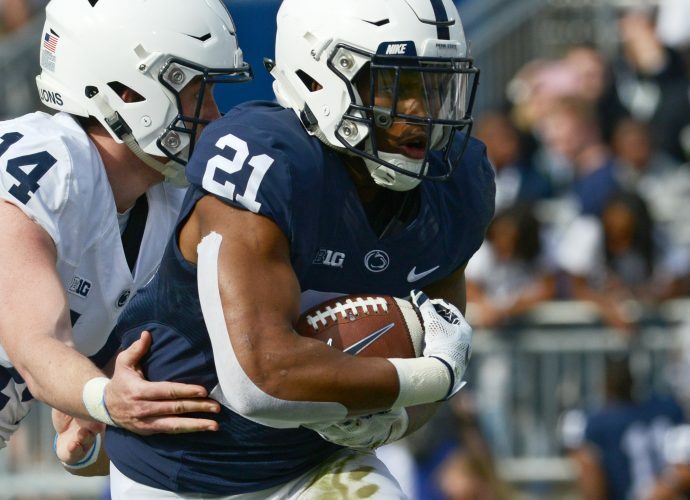 Fans are always heavily interested in younger players they haven’t seen yet in a Blue-White Game, and that’s the case this year with prized freshman linebacker Micah Parsons and others. Franklin said having a large number of early enrollees, such as Parsons, helps in the spring. “I think this is where the mid-semester guys are so valuable, because without them, it would obviously change the way we run the game and run spring practices,” Franklin said. The coach also discussed how much today’s scrimmage can mean to the early enrollees, since it will be their first time playing in Beaver Stadium. “I think it means a lot,” Franklin said. “It means a lot for us to be able to evaluate those guys and see if they are who we think they are, how close they are to being able to contribute. It’s not something that fans may think of, but young players have to practice things other than football. They also have to practice things such as how to enter the stadium, get the lay of the land in the locker room and stretch on the field. Franklin has said repeatedly over the years that he would like to get the team into the stadium more often because that alone offers a lot of learning experiences. NOTES: Comedian and Franklin impersonator Keegan-Michael Key, a Penn State alum, will be a guest coach for today’s game. No one knows exactly what role the comedian will have, but it wouldn’t be a surprise to see his Franklin impersonation at some point.